You're invited to celebrate Easter 2019 with us. All services are identical and intended for ages 6th grade through adult. Children infant through 5th grade are invited to their own age-appropriate services in KidsWorld. Click here to download a digital invite or a flyer. Remember Jesus' sacrifice with us at one of two Good Friday services on April 19 at 5 & 7pm. Services will feature teaching by Pastor Clayton Keenon. Children infant through kindergarten are invited to KidsWorld. 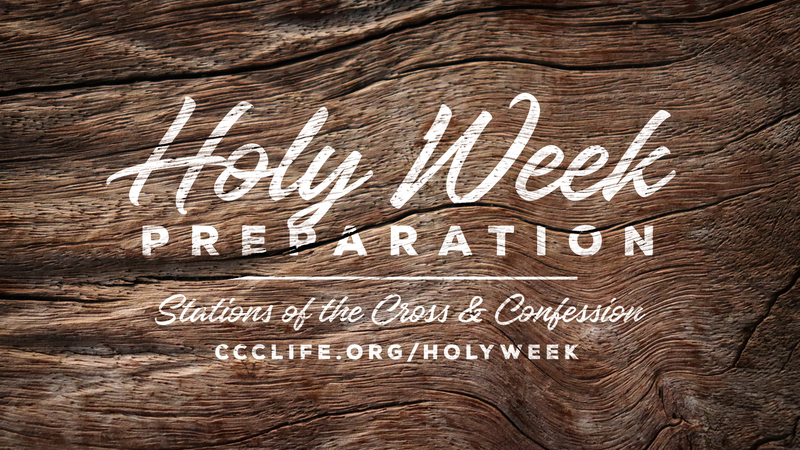 This Lent, we are encouraging some traditional practices of the season--specifically reflection and confession. Struggling? You are not alone. Care Night (Tuesdays 6:45-9pm) is the place for you to find hope, help, and healing in the midst of addiction, depression, grief, a marriage in need of a tune-up, and much more. The spring semester begins April 16. See all our groups and register at ccclife.org/carenight. Questions? Contact Kim at or 630.485.3386. Alpha has ten sessions and includes dinner, a short talk, and a discussion where anyone who has not surrendered to Jesus (or recently have) can explore the basics of the Christian faith in a friendly, honest, and informal environment. Join us beginning Monday, April 29. Register at ccclife.org/alpha. Childcare is available. Our two-week Begin to Belong class is both for those interested in membership and those committed to being part of how Christ Community is making passionate disciples. The next class is April 28 and May 5 during the 11am service. Register at ccclife.org/begintobelong. Love Your Neighbor is back. Grab your Community Group and a $200 grant to serve an individual or family that could use help. Visit ccclife.org/loveyourneighbor to register. Or check out the Simply Serve calendar to take part in our Summer Serve on June 8. Help at a senior center, Marklund Home, or Elgin food pantry. Camp Commotion is our fun, safe, and affordable all-summer day camp for children entering 1st-6th grade. Choose from 20 activity options and make it a summer they won’t forget! Register now to ensure your spot; don't wait! Learn more at campcommotion.org or call us at 630.733.8929. KidsWorld Clubhouse (June 10-14) is back to a morning schedule for 2019: 9:15 am-12:15 pm. Clubhouse is designed specifically for preschoolers age 3 through entering Kindergarten. Each morning, kids will learn about God, engage in hands-on activities, sing songs, and a whole lot more! Register today at ccclife.org/clubhouse. Head to the Welcome Center after Sunday services this weekend to meet and pray with a pastor from our finance ministry. Calling Parents of Blended Families! On Saturday, April 27, we will host the Family Life Blended & Blessed simulcast event from 8:30am-3:30pm. Lunch will be provided and childcare reimbursement will be available. Registration is required at ccclife.org/blendedandblessed. Seniors 60 and over are invited to join Primetimers for the film Son of God on Thursday, April 18 (11am-1:30pm). Free event; no registration. Learn more at ccclife.org/primetimers. Following an extensive selection process, the elders are recommending that the following people are added to the St. Charles elder team for a four-year term: Taylor & Erin Clausen, Mitch & Mary Crews, and Tim & Kaye Downey. The elder team is also recommending appointing current trustee Mitch Belon to Trustee chair. These individuals will begin serving in these roles on July 1. Please direct any comments, questions, or concerns to Dawn at 630.485.3303 or . Women: Writer Priscilla Shirer is coming to Chicago on November 2 for the Going Beyond Live event. We will be going as a group. Learn more: ccclife.org/going-beyond. Check ccclife.org/water regularly to see updates on how God is using the more than one million dollars given to build wells in Sierra Leone. Men of all ages are invited to gather and pray together for our church, families, and one another on Saturday, May 11, from 8-9am. Fellowship and snacks will follow. Learn more: ccclife.org/mensprayerevent. Following an extensive selection process, the elders are recommending the following be added to the St. Charles elder team for a four-year term: Taylor & Erin Clausen, Mitch & Mary Crews, and Tim & Kaye Downey. The Elder Team is also recommending appointing current trustee Mitch Belon to Trustee chair. These individuals will begin serving in these roles on July 1. Please direct any comments, questions, or concerns to Dawn at 630.485.3303 or . Child Dedication will be held on Mother’s Day weekend, May 11 & 12. An approved application and attendance at our preparation class are required. Visit ccclife.org/childdedication to apply online or receive more information. Help make KidsWorld Clubhouse a great week for our preschoolers this summer. Clubhouse is looking for 75 adult and student volunteers to serve June 10-14 in the morning. Serve directly with kids or consider serving in many other support areas during camp. Childcare is available for volunteers that have children under 3 years old. Check out all the serving opportunities at ccclife.org/clubhouse. KidsWorld is reaching the nations again this year by collecting items to be taken on future Go Teams. Your family can help by donating the following new items: toothbrushes, children's vitamins, bandages and antibiotic ointment. We cannot accept toothpaste because it does not travel well. Drop-off donations in marked collection bins in KidsWorld between April 6-21. For the entire month of April, all Bibles and Study Bibles will be on sale in the Re•source bookstore. You can read and journal along with our four-year Bible reading schedule in three ways: 1) Purchase the Bible Savvy or EPIC Journal at our Re•source bookstore. January-April is available now. 2) Download the CCClife mobile app; a free version of the Bible Savvy Journal is built in. 3) Subscribe to the daily Bible Savvy email at ccclife.org/biblesavvy. Work where you worship; visit ccclife.org/employment to learn more and to apply.